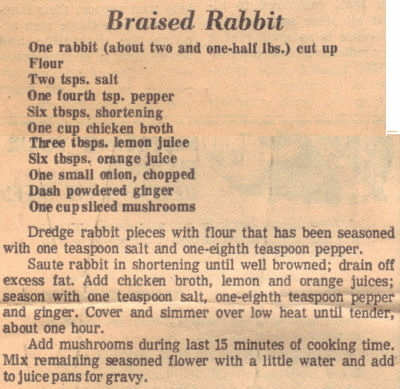 This recipe was clipped from a newspaper and found in a large collection, date unknown. I’ve typed it below along with a scanned copy (spelling error corrected). Dredge rabbit pieces with flour that has been seasoned with one teaspoon salt and one-eighth teaspoon pepper. Saute rabbit in shortening until well browned; drain off excess fat. Add chicken broth, lemon and orange juices; season with one teaspoon salt, one-eighth teaspoon pepper and ginger. Cover and simmer over low heat until tender, about one hour. Add mushrooms during last 15 minutes of cooking time. Mix remaining seasoned flour with a little water and add to juice pans for gravy.